For brewers who want to start treating their water appropriately, but don’t want to wade through the requisite chemistry, here’s the second in my series of simple water guides. Today’s post is a quick guide to generating brewing liquor for dark beers, starting with distilled water as the base. 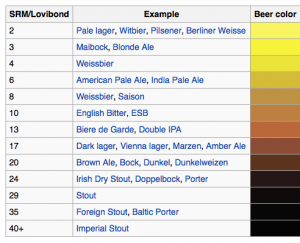 I’ll discuss beers ranging in color from 30 to 40 SRM — porters, stouts, and the like. I will post the remaining two water guides — for brown beers (20–30 SRM) and pale beers (0–10 SRM) — soon. I’ve skipped to dark beers because of an interesting quirk to making brewing liquor for dark beers. Specialty malts are darker than base malts and also more acidic. 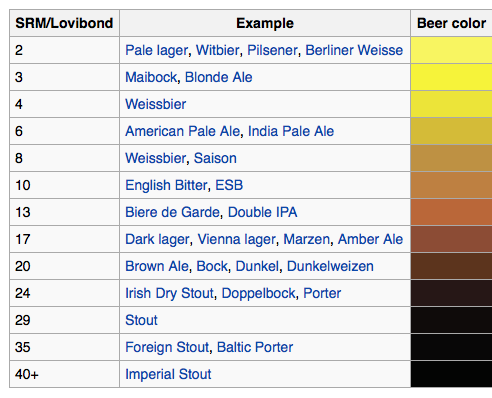 Therefore, darker beers tend to benefit from brewing liquor that contains more carbonates. Correctly balanced, the carbonates neutralize enough of the acidity from the grains to keep the mash pH in the proper window. It can also keep the finished beer from being too acidic. If a dark beer is brewed with water that is low in carbonates (low in alkalinity), it can come out too acidic and the dark grain character is less pleasant. There is, however, a twist. The acidity of crystal malts increases with increasing color. Black malt and roasted barley (between 300 and 500 °L), however, are onbly as acidic as dark crystal malts (in the 60–120 °L) range. In other words, the darkest roasted grains are not proportionally more acidic than crystal malts and don’t get more acidic with increasing color. So, if you’re basing the amount of carbonates in your brewing liquor on the color of the beer (which is exactly what I am are doing in these guides), higher levels of roasted malts in your grist are going to lead to adding more carbonates than you need. There’s a fairly simple workaround to this problem. The solution is to briefly reformulate your beer and switch any darkly roasted grain to dark crystal malt. You obviously won’t brew the beer this way, you’re only doing this to get your brewing software to calculate a more useful number. So, take your beer recipe and replace any darkly roasted grain with the same amount of a dark crystal malt (crystal 120 °L, for example). Alternately, change the color rating of your darkly roasted grains to around 120 °L. Note the SRM the brewing software calculates for this, then return the recipe to it’s correct formulation. Now, take the lower, revised SRM and formulate your brewing liquor based on that. Here is a guide to making 5.0 gallons (19 L) of brewing liquor for a dark beer, starting with 5.0 gallons (19 L) of distilled water. If you are a 5.0 gallon (19-L) extract brewer, you only need to make half this volume. Halve the volumes of water and the amounts of minerals added. Use the treated water (the brewing liquor) for steeping your grains or doing a partial mash and for the water in the boil. Use distilled water for topping up to your full batch size. All-grain brewers will need to estimate how much water they will need and mix up sufficient brewing liquor. Your first step is always to ensure that your brewing liquor has sufficient calcium. Calcium has a number of benefits in the mash and in the boil. Normally, I start with at least 100 ppm (roughly 100 mg/L) of calcium in my brewing liquor. For the darkest beers, I lower this slightly to 75 ppm. That way I will have less baking soda to add (as calcium lowers the pH of a mash while carbonates raise it), which will keep the sodium levels down. No matter what your estimated beer color is, start by adding calcium to your 5.0 gallons (19 L) of distilled water. If you are brewing a beer with a nice malt and hop balance, add 0.75 tsp. (roughly 3 g) of gypsum (CaSO4) and 0.75 tsp. (roughly 2.6 g) of calcium chloride (CaCl2). If you are brewing a hoppy beer, such as a hoppy porter or black IPA, add 1.5 tsp. (roughly 6 g) of gypsum and no calcium chloride. In both cases, this will give you roughly 75 ppm calcium. The second, and final, step is to add an amount of carbonates to the water that is appropriate to counter the acidity of the dark grains. Use your revised SRM and follow these instructions (or the instructions for a brown beer, if the revised SRM falls in that range). For a beer near 30 SRM, add 1.66 tsp. (roughly 7.3 g) of baking soda (NaHCO3). For a beer near 40 SRM, add 2.2 tsp. (roughly 9.7 g) of baking soda (NaHCO3). For beers between 30 and 40 SRM, add an intermediate amount. For example, 1.9 tsp. (8.4 g) of baking soda (NaHCO3) in 5.0 gallons (19 L) of distilled water is the right amount for beers that are estimated to be around 35 SRM (again, using the revised SRM estimate). You should taste the distilled water before treating it, and after the minerals are dissolved. At first, it shouldn’t taste like anything. With the minerals added, it should taste pleasant (as you would expect mineral water to taste). If you are an all-grain brewer, you should take the pH of your mash — and it should fall within the 5.2–5.6 range, with the lower half of this range being preferable. Keep in mind that, with a very dark beer, the mash pH may initially be low. If so, however, it should climb as the mash rests and eventually fall into the right range. And finally, you should taste your beer critically. If you have brewed dark beers before, treating your brewing liquor should improve their flavor. If it didn’t, your local water is likely suitable for brewing beers in this color range and there is no reason to go to the extra hassle. Chris, trying to use your water treatment method for an Irish Stout. Base malts are just two row and flaked barley with roasted malts just half lb each of black malt and roasted barley. When I use your method of replacing the roasted malts with dark crystal just for calculation purposes (using Bru’n Water), it drops by estimated SRM all the way down to 13 SRM. Should I drop all the way down to your amber guide and use the suggested amounts from that? Yes, give it a try at 13 SRM. The darkest grains do not lower the pH of the mash proportionally to their color, when compared with crystal malts. Hi Chris, Water treatment you suggest should be done to your mash and sparge water, correct? Chris, Also Gypsum and Calcium Chloride to lower Ph and Baking Soda to rise Ph, why? Can you please explain.